Mount Vesuvius (Italian: Monte Vesuvio, Latin: Mons Vesuvius) is an active volcano on the Bay of Naples, southern Italy. Its last eruption was in 1944, the most recent of any volcano on mainland Europe. 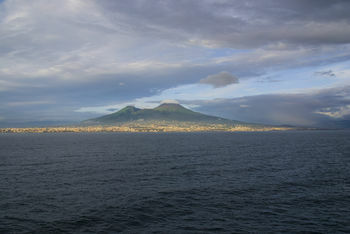 Mount Vesuvius is believed to be one of the remnants of a supervolcano which formed the Bay of Naples, Vesuvius and other volcanic areas nearby, such as Solfatara. The original volcano was formed by a subduction zone. This was when the African plate was subducted underneath the larger Eurasian plate, causing it to melt into magma. This magma was pushed upwards because it had a lower density than the rock above it, and reached the surface in the form of a volcano. 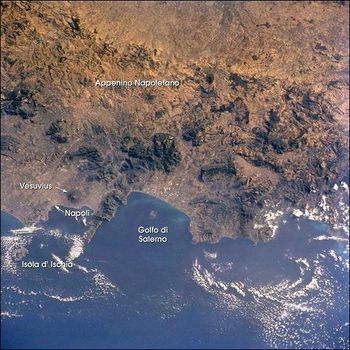 The eruption of A.D. 79 buried the Roman towns of Pompeii and Herculaneum and their inhabitants. The settlements were preserved by the eruption are today are important archaeological sites. This page was last modified 18:44, 30 April 2013.